A month later, life seemed to go back to normal- John attended to his Beatles' duties and Cynthia tended to Julian and the household. But in their minds, both knew that nothing is the really the same. John was in love with Yoko and Cynthia had a one night stand with Alex. Every time she sees Alex, she gets nervous, tense, but Alex gave her the impression that he wouldn't tell and that he's moving on with his life. But unknown to Cynthia, Alex did tell John that he did sleep with his wife. John was furious, but then he thought differently. This gives him a great excuse to free himself for their marriage so that he may be with Yoko. At every possible chance, he would try to see her. They would meet up secretly, John would tell Cynthia that he needed to take care of a few things, check out new artists, and he would make sure his staff would kept their word to secure John's whereabouts. In the middle of June, John and Paul were scheduled to fly to New York to promote Apple Records. Cynthia had planned a little holiday for her mother, Julian, and herself to Italy, but was willing to cancel to be with John to go to New York. "No, no, you go on ahead, go to Italy with Lil and Julian," John said. "I don't care, I'll keep myself occupied, please John, let me go with you, I promise that I will keep out of the way, just as long as I'm with you," said Cynthia, hoping that John will give in. "Cyn, just take that holiday to Italy, you can spend special quality time with Lil and Julian in a beautiful country. Besides, Julian may like Italy," said John, hoping that Cynthia would give in. Cynthia thought about it, it would be nice for Julian to see. He has been there before when he was three, and he's been to Greece last year. "Okay, I'll go on with the holiday," said Cynthia, giving in. "Great!" said John, leaning in to kiss her on the nose. A week later, Cynthia, Julian, and Lillian were all packed and ready to go to Italy. While Les packed their Rolls with their luggage, John was nervous and jittery. Cynthia thought that he feared that he may be losing his son, and tried to comfort John, saying that he will never lose Julian. But that wasn't really the case. John was really nervous about how he should break the news to Cynthia of how to end their marriage. Within minutes, Cynthia, Lillian, and Julian were gone. John let Dot have the rest of the day off so that he could have an opportunity to have Yoko over. When Dot left, John called her and asked her to come over. A half an hour later, Yoko arrived. Two seconds after her arrival, both of their clothes were on the floor in front of the door, and in the sun-room, John and Yoko were found on the settee, making love. John knew that they'll apart for when he's in New York and wanted to spend time with her as much as possible. "When I get back, we will be doing this for the rest of our lives, and you are not going to be out of my sight," said John, breathing heavily with a fast beat. "Oh John!" exclaimed Yoko, her arms held tightly around John's waist, holding him on top of her, holding him tight so that he wouldn't fall off the settee that they were on, they were too big, but it didn't matter- it was worth it. John figured that by the time he will be back in England, he will get the message through to Cynthia that he wants nothing to do with their marriage. He also decided that he will get custody of Julian, especially since he decided that when Alex told him about his sexual experience with Cynthia. In his way of mind, it was revenge. John and Yoko continued making love, eventually falling onto the floor, laughing hysterically. They went at it for three more hours, nonstop. By early evening, they decided that it was time for a break. Wrapping their arms around each other tightly, they walked to the den, naked, and fell onto the couch and watched television. Nothing interesting was on, so they kissed passionately. When their kiss went into deep concentration, the phone rang, interrupting their beloved tender moment. "What!?" John exclaimed, angry at the fact that he was interrupted. "John? What's the matter with you? I'm just calling you to tell you we got to Italy safe and sound," said Cynthia, shocked at his greeting. "Oh, hi Cyn, I'm sorry, it's just that I was concentrating on this damn lyric of this song that I wanted to get done," John lied, Yoko rested her head against John's chest, trying not to giggle too loudly for Cynthia to hear. "I'm sorry, honey, but I just thought that you should know that we are in Italy and Julian suggested that we call you and say 'hi'", explained Cynthia. John heard Cynthia's voice calling Julian, telling him that Daddy wanted to speak to him. "I can't wait to see you"
"I can't wait to see you either... you better not grow on me again boy!" Julian giggled and handed the phone back to Cynthia. "Well, you three have a lovely time and I will see you soon," said John, knowing that the next time he will see his wife will be under difficult circumstances. "Bye Cyn," John hung up, he didn't bother saying 'I Love You' to his wife, because he's in love with someone else- who happens to be in his arms. "When is the right time then?" "When you and I announce that we are in love and are not ashamed of it." "No! Of course not, it's just that until Cyn and I are separated, I will announce it"
"I'm going to send someone to Italy and tell her the news"
"Why can't you do that yourself?" "Because, I'm going to hurt her feelings"
"John, you are hurting her feelings, right now! You didn't even bother telling her that you love her-"
"Yes, I know that, but John-"
"Look Yoko, you don't know Cyn, I do, she's my wife and I will do this MY way! Okay?" "Okay, good... so how about you? Are you and Tony finished?" "When are you going to tell him?" "The same time you tell Cynthia"
John and Yoko grew silent. 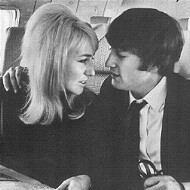 John took his hand and placed it on Yoko's cheek, carrying it up to face him and dove into a deep passionate kiss, going back to where they stopped. A few seconds later, they were making love again, on the couch in the den.